Bumblebee birthday ideas for an easy and unique do-it-yourself party. 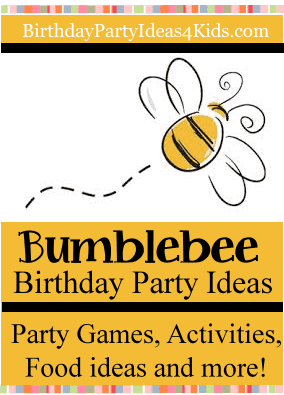 Mix and match these great bumblebee ideas to create your perfect party - games, decorations, invitations, favors, food, goody bag, activities and more! Black and yellow printed note cards - polka dots, stripes, paisley ... any black and yellow combination. Embellish a plain yellow note card with a piece of black and white polka dot ribbon glued on the front vertically. Inside the card write "Buzz on over to the ___________ (last name of family) hive for an unbeelievable good time!" "Buzz on by around ________ (time of party)"
"RSVP to the Queen Bee at __________ (phone number)"
Decorate your Bumblebee party with black, yellow and white. Mix and match prints and solids in these three colors such as polka dots, strips, swirls, paisley etc. Tie black and yellow helium balloons on the mailbox to show guests where the birthday party is located or wrap in black and yellow tulle. Decorate party tables with bright yellow tablecloths with black / white patterned runners. Black plates, flatware and cups. Tie black and yellow balloons around the whole area. Drape black and yellow tulle that hangs from the ceilings center out towards the corners of the room. Cut ribbon the length of the headband and put it next to the headband ... punch two holes in the ribbon that match the spacing of the antennas. Thread the pipe cleaners through the holes (one for each antenna) and then glue the ribbon to the headband. Glue large pompoms on the ends of the antennas. Paint the bumblebee guests faces to look like bees. Use our homemade face paint recipe. Buy plastic flowers and small prizes. Before the party write a number on some of the flowers with a permanent marker and write a corresponding number on the prizes. Hide the flowers all over the party area. Give guests a yellow or black sack (or basket) and tell them to find as many flowers as they can. After the bee hunt they can trade the numbered bees for a prize that corresponds with it's number. A great activity for the backyard or park. Make 2 teams or more teams. Our nature scavenger hunt list is free to print out and use for this game. Play this game just like Pin the Tail on the Donkey. Draw a large beehive with a beehive entrance on a poster and hang it on the wall. Cut out yellow circles from paper and draw black stripes on one side. On the other side write the child's name or a number. One by one blindfold the kids and let them try and pin their bee the closest to the beehive entrance. Younger children love this game. Cut large beehives out of poster board or felt. Make one beehive per guest. Put the bee hives around the floor of the area you will be playing in. 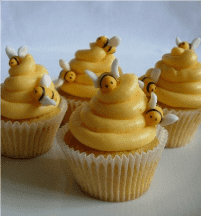 Tell birthday guests that they are going to pretend to be bees. They will fly around the room when the music plays … but when the music stops they must find a beehive to land on. If you give away prizes: Before the party buy small prizes - enough for each guest - with a bee theme. Number each prize. On the back of each beehive write down a number that matches a number on each prize. When the last round of the game is played tell players to pick up their beehives and find the number on the back. Then let them pick up the number of the prize they have on their hive. Variation: Instead of beehives use flowers. Large yellow suckers - print label with a cute saying such as "Bee Happy", "Bee utiful! ", etc. and stick onto the suckers. Tie black ribbons around the top of the sucker stick . Stick the sucker sticks into craft foam in a pretty black and yellow container. Yellow bottles of bubbles (print out label that says "Bee cause of you the party was great!" and stick on the outside of the bubble bottles. Black and yellow and black printed material or bandanas - wrap party favors inside and tie the ends together.